If you Google The Great Exhibition, you will find the most superb pictures of this vast building, on two floors, with all the ladies and gents in attendance. You will also find a floor plan of the two floors. On the ground there is a section for Spain, with Portugal & Madeira. Directly above, on the upper floor, there is a section for 'Lace & Embroidery' amongst the silks, shawls and clothing. Jump 70 years or so and a young lady, a socialite and actress called Miss Athalie Davis was invited to a Faculty of Arts Ball at Grosvenor House in London. 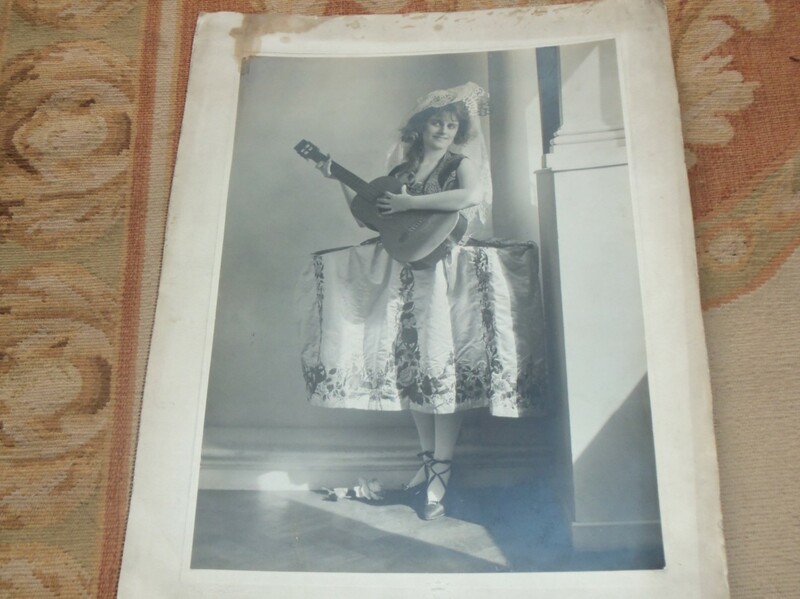 A young flapper of beauty, she chose to wear the outfit that her great aunt made for the Great Exhibition. 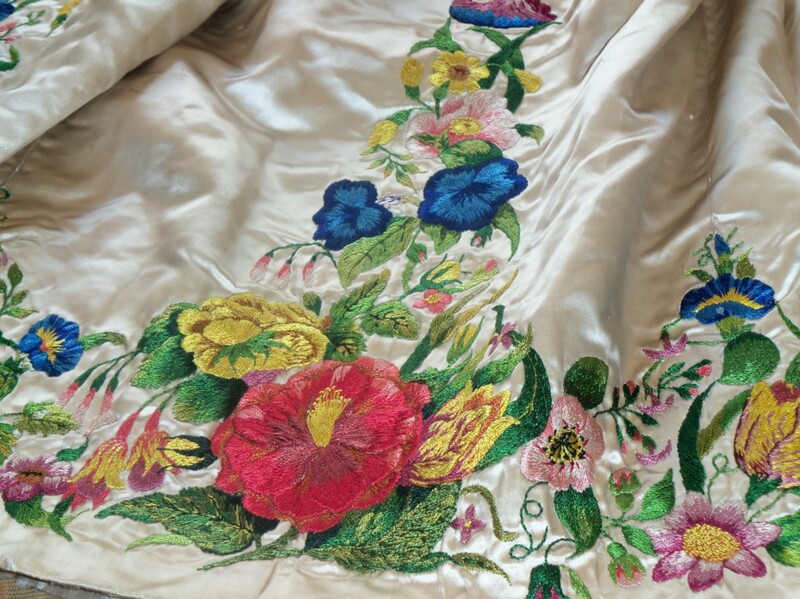 She informed the newspapers that her great aunt had used over 400 skeins of silk thread in constructing the outfit in the 16th Century Spanish style. And this is it! 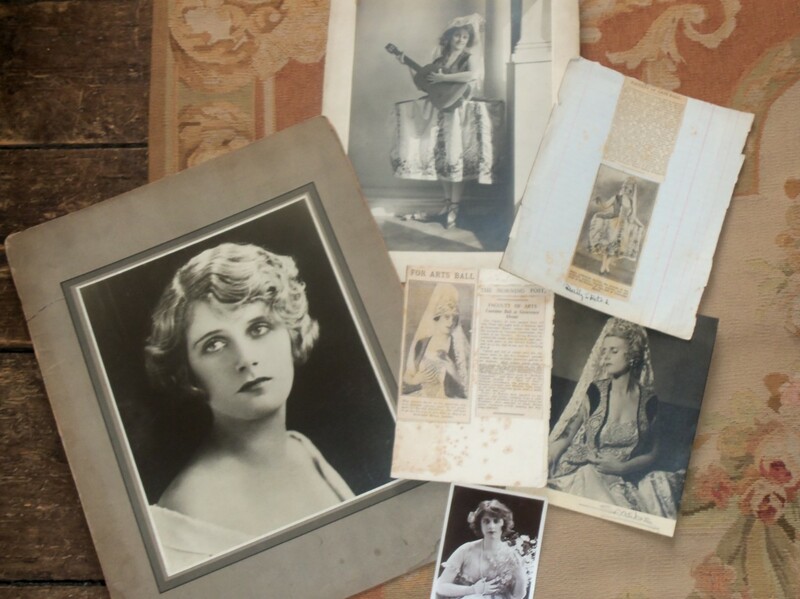 The outfit came with a range of photographs and two newspaper cuttings with this information. 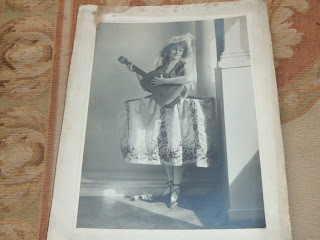 Sadly the mantilla and other accessories shown in the photo's did not survive with the main costume. I wonder if it was displayed in the Spanish section or the Lace & Embroidery section? Now there is no doubt that the skirt would have been the main focus for the Exhibition of this outfit. 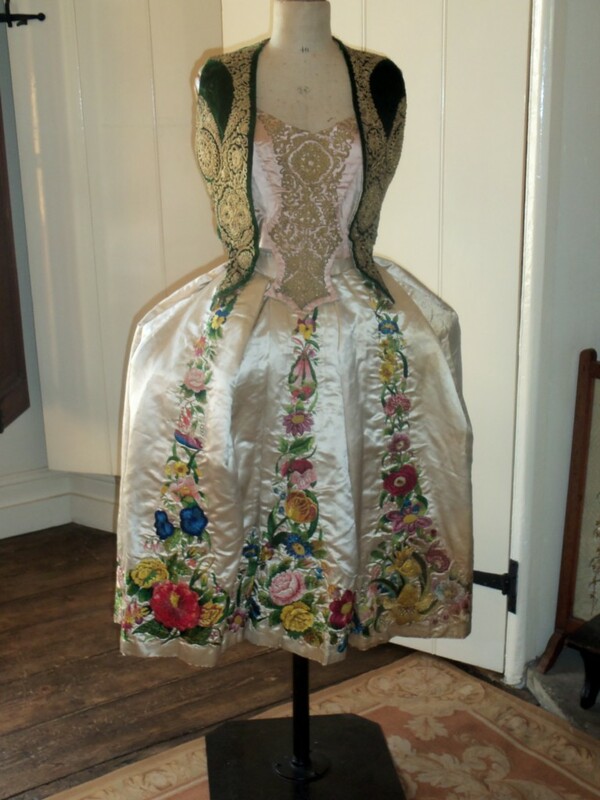 I am sure that it should go to a collector of embroidery, rather than costume, which is why I have reluctantly split this superb outfit. One can immediately see where most of the 400 skeins of silk thread went! 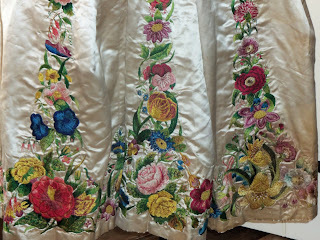 The magnificent 19th Century embroidery goes all around the base of the skirt in depth and then rises in peaks, no less than 7 times! Up the skirt they climb, every flower in the Victorian garden I would think! Excellent use is made of French knots to make the piece stand out and the skill is simply unmistakable. All of the embroidery is undamaged, as is the face of the heavy silk, no splitting or holes at all. There is a section of the lower skirt that is discoloured, quite a large area. In my opinion, this is not unsightly. Please do not, under any circumstances, take this to the high street dry cleaner. If you wish to have it cleaned, consult a museum who will recommend a restorer for you. 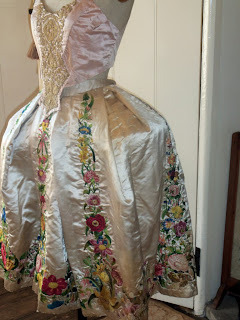 Now, the skirt is just like the bodice in that it was not made to be worn. 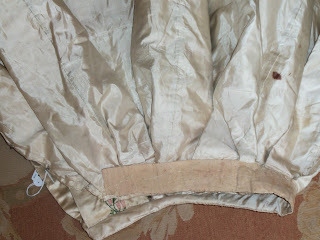 Therefore the waist is made to be just as full as a crinoline, but with no fine pleating. 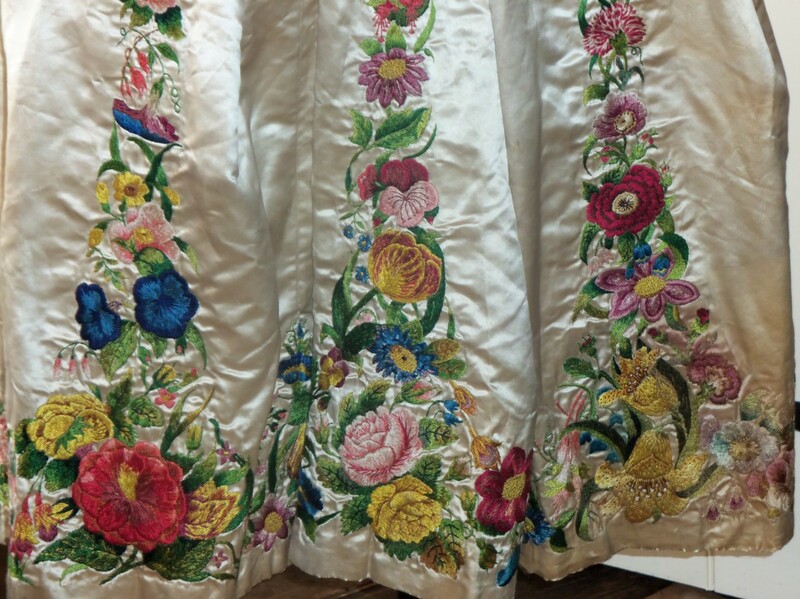 Insted, there are huge inverted pleats, each pleat to display one of the rising flower embroidery panels. The young Athalie wore the skirt with a pannier below it, so I have shown it in the same way, but my modern pannier is not included in the sale. 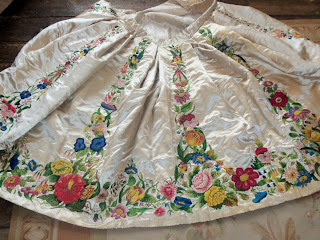 The skirt is not made in this shape, so a round crinoline or even a petticoat would display it just as well. I have shown it with nothing below so you can see. I am in two minds about the length of the skirt. Obviously it is short. Now this could be because the glass display case at the Great Exhibition would only fit something of this height [thus is was made to measure the cabinet]. Alternatively, Athalie was a young and vibrant flapper, so could have had it shortened at the waist. I don't think we will ever know. 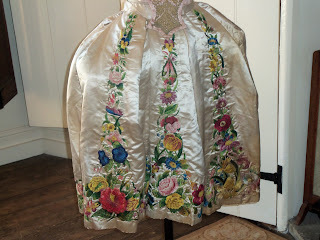 What I am sure about is that none of the fabulous embroidery has been lost! In any event, the waistband is quite crude and missing it's top hook and eye. In addition, the hem crease edge is a little split - this is hardly noticeable. 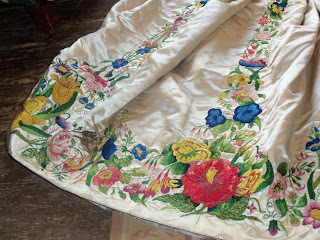 Fully lined in 'paper silk' which is stained in places but not split - if you read the description of the other two parts you will know that I feel strongly that this lining silk is Georgian 18th Century. 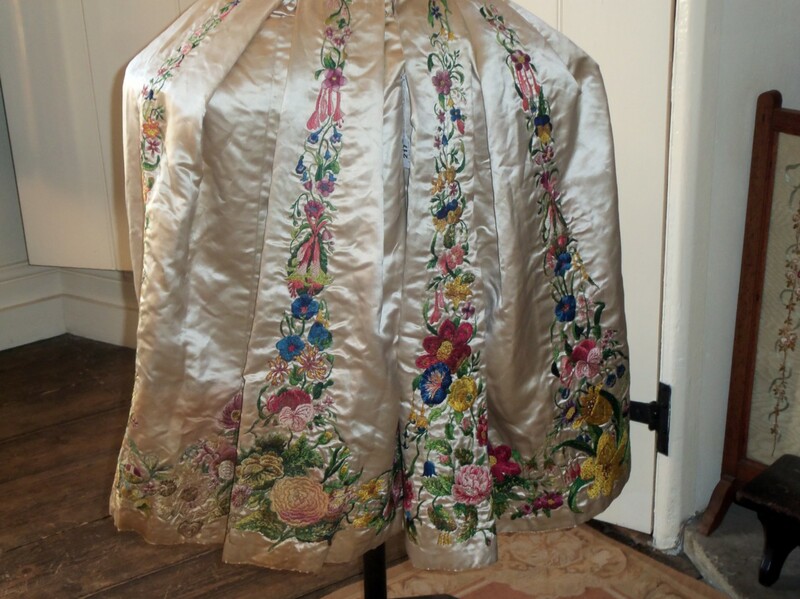 Although not interlined, this is a very heavy skirt and feels most substantial, the top silk being far heavier to cope with the vast embroidered panels. 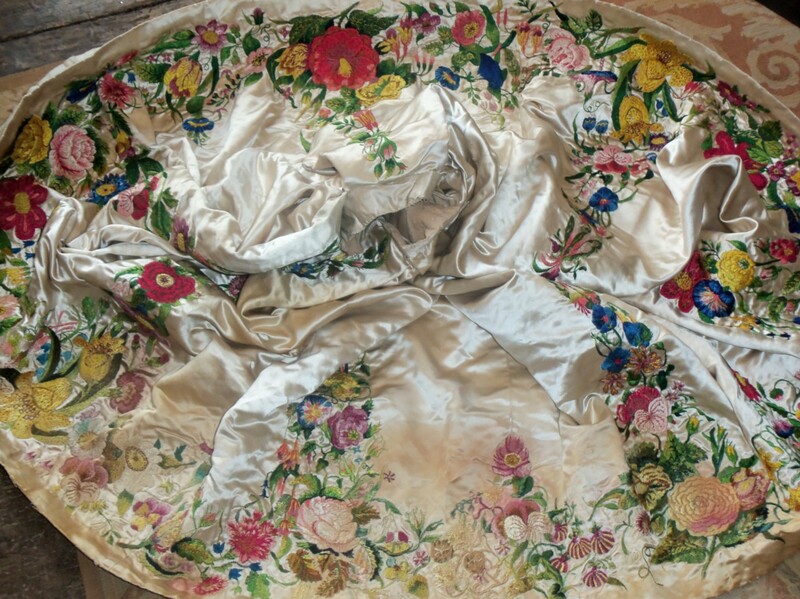 Waist approx 24", if you wear it and spoil it the value will be significantly decreased. You will never see one of these again! ******* The original documents of the provenance will be sent with the sale. *******The skirt and provenance weigh almost 2kg. I will not post this item by parcel post, so you must choose another postage option if you win it. 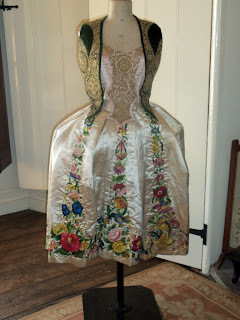 Dress U sewing madness followed by the flu hit me among many other life details that some of you know. It's the reason I've gone silent for the bast few weeks, I apologize. 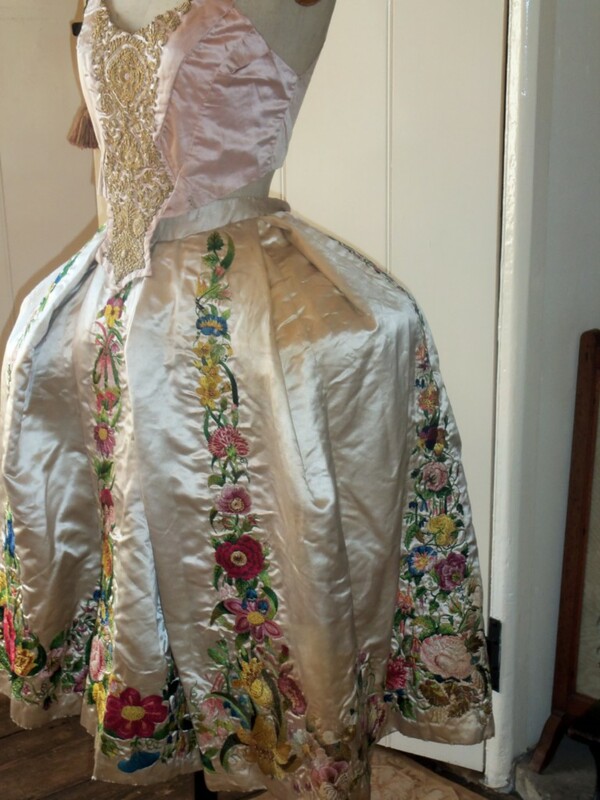 I'm a bit more than peeved that the seller split this outfit up. Uh...how are you going to send original documents with three separate pieces? And it's hardly 16th C - 18th Century theater, perhaps- but not 16th by any stretch of the imagination. 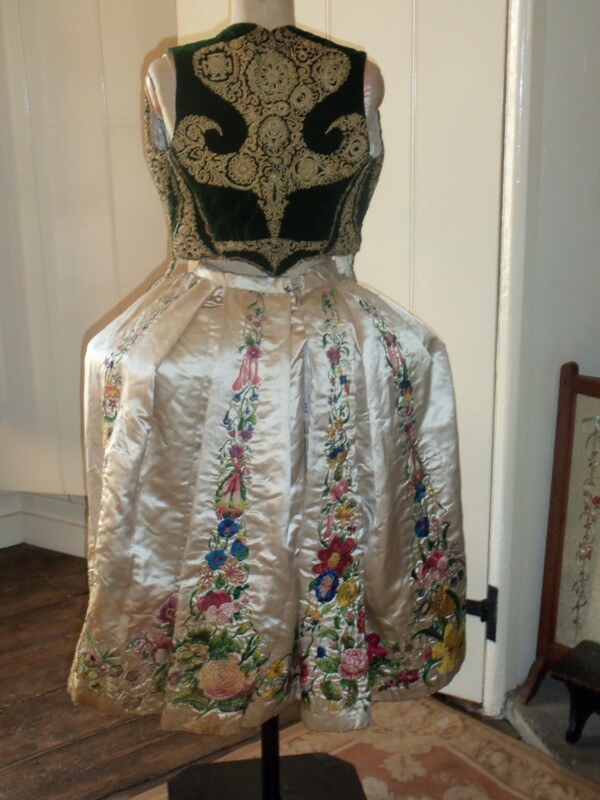 It is, however, a lovely example of mid 19th C embroidery! Thanks for posting it this way! I've been reading on a RSS feed on LJ and this allows me to focus in on the areas I am researching more easily. And it's eye candy in the morning!